You can now purchase and use vaporetto, bus, and tram tickets--including tourist passes--with your smartphone. But be aware of the hassles before you buy. ABOVE: The QR-code scanner on the left is supposed to work with your smartphone, while the "swipe and beep" ticket reader on the right is designed for paper tickets and plastic cards with embedded chips. In theory, this is a great idea for people who use their phones for everything and don't want to bother with traditional paper tickets. To make matters worse, the app won't work with larger smartphones, and ACTV warns that the QR codes may not be readable if you don't crank up your phone's brightness to full intensity. We think most people will be happier with ACTV's traditional tickets and passes, such as the popular Tourist Travel Cards. They're easy to buy from ACTV ticket counters, ticket machines, tobacco shops, newsstands, etc., and their embedded RFID chips work reliably with the transit agency's time-proven "swipe and beep" electronic ticket readers. Still, if you enjoy being a technology guinea pig, and if you don't mind using an app that has terrible user ratings, you can find Google Play and Apple Store links at the ACTV's official AVM Venezia app Web site. "Hi, I found your site really useful before a short visit to Venice. I stayed in Mestre near the T1 line and the Living Venice magazine in the hotel had an advert for AVM and its new app for buying and saving a mobile ticket. Easy registration, purchase of the 72 hour ticket and activation of the QR code-- great so far. "Off to the tram and no sign of any QR scanner at the stop. Just got on assuming it was on board. But that one only detects the RFID cards for validation. Nervously I stayed on, having read your section about fines for not validating. I seemed to be the only person with the mobile ticket, although many people boarded and didn’t bother using the RFID machine. I made sure my phone had enough power should the inspector arrive, and a rehearsed sob story! (On the last day this did happen and he just checked manually that the ticket hadn’t expired, the time remaining is clearly shown). 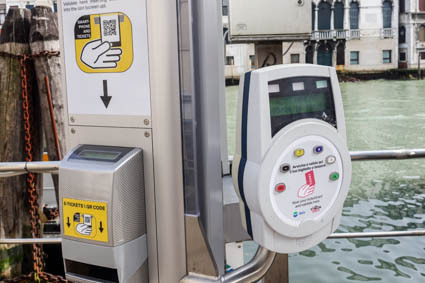 "There was a more serious issue at some vaporetto stops with gates, in that the QR scanners provided didn’t all work. Most were fine but at the San Zaccaria stop F for going towards Lido, one didn’t recognise the code at all and the other made my phone go straight to Apple Pay as if it was set to detect RFID, not a barcode. So I had to go one stop in the other direction then back again. It was even worse on the way back, virtually all of the scanners at Lido SME which is totally gated didn’t work or went to RFID as before. Eventually one worked although not on the route I wanted to use. There were also no staff around to help. "Presumably things will improve but I would urge caution to other travellers choosing this format especially for the vaporetti at bigger stops with gates. As for the tram, it's useful to know that if there is no gate you can just board and show the code should the inspector appear. I didn’t use the buses, presumably you just show the code to the driver."